Regulation size of bocce ball courts is 13' by 91' but with space so limited in South Florida we do find many courts with much smaller dimensions. Backyard bocce ball courts are almost always smaller perhaps 6' by 64 feet and of course courts inside restaurants such as Louie Bossi Ristorante are much smaller and meant mostly as a novelty and to enjoy a friendly game with family and friends just after that after dinner shot of sambuca. Those on the larger courts tend to drink red wine but that is not always the case as there are some bocce ball players who do not drink at all. If you're looking for a really nice court in South Florida you will want to consider the court in La Piazza in Ironside Miami which was designed by businessman Ofer Mizrahi. The local Italian organizations especially Sons of Italy is involved in charitable construction of local courts especially in Catholic schools and they are a great source to go to for Bocce Ball related events and even local places to play bocce ball. 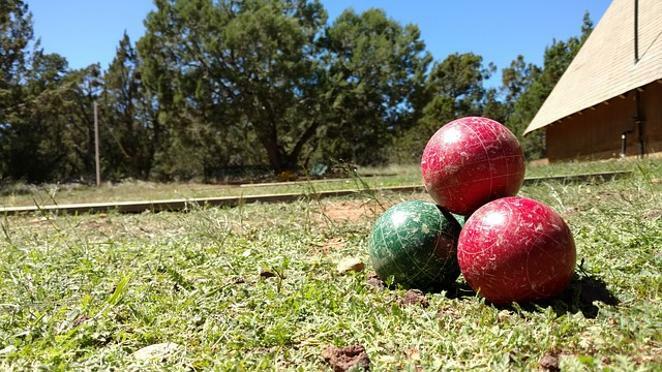 Thee is also a meetup group called Free Range Bocce Ball, they have many members but they do not play on a court rather an open space.